Published with the Glasgow Museums. 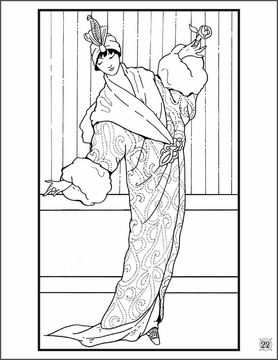 In 1912 and 1913, Paris fashion designs for women were high waisted, long sleeved, floor length, and often made of flimsy, see-through material. Dress silhouettes were wide at the hips and very narrow at the ankle. Fashionable clothing was only for the rich, because it was expensive and impossible to work in, and although beautiful, a lot of it was extremely uncomfortable to wear. To squeeze into fashionable outfits, women wore long girdles, which made it difficult to sit down. Some skirts were so narrow at the knees that the wearer could only take tiny steps. Imagine running for a bus or taxi in those clothes! Even getting into and out of a car would be nearly impossible. Coats were cocoon-like or kimono shaped. Fur coats and stoles were very popular, and women often carried a huge matching hand warmer, called a muff. Cloth coats were edged with fur, too—fox, otter, chinchilla, mink, rabbit, and even squirrel and skunk fur. Women also wore striking but rather ridiculous hats—some turban-like, some shaped like lampshades, and others festooned with ostrich, peacock, or other large feathers. In the early twentieth century, there were no high-fashion models, runway shows, or glossy women’s magazines with gossip about celebrities. The first Paris fashion magazines featured hand-colored prints like the ones displayed on the inside covers of this coloring book. 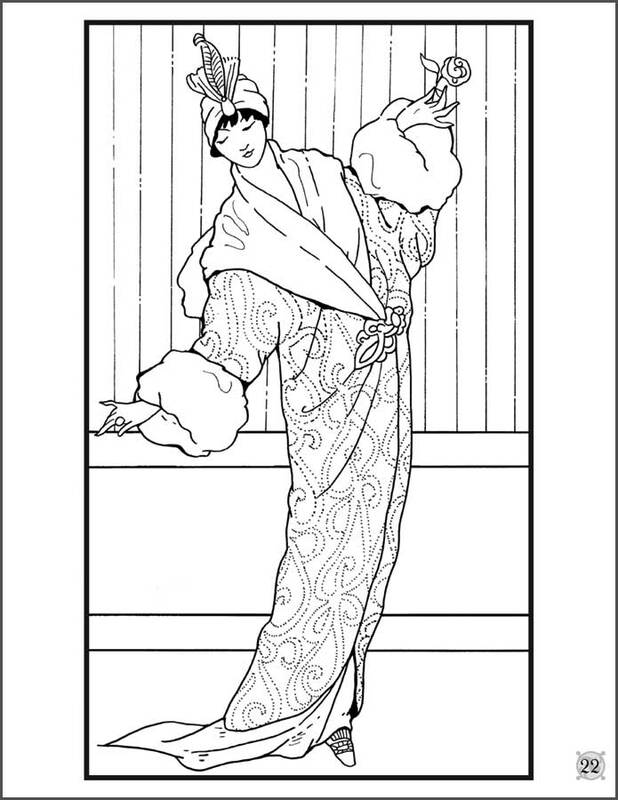 When you fill in the twenty-two line drawings, have fun choosing dramatic color schemes, and daydream a bit about what it would be like to wear these elegant, but oh so impractical, clothes. 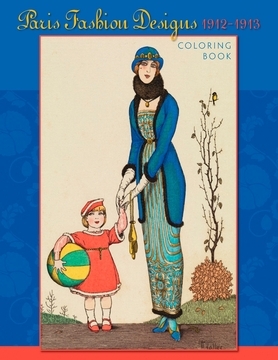 We’ve left the last page of the book blank so that you can draw and color an outfit of your own design.